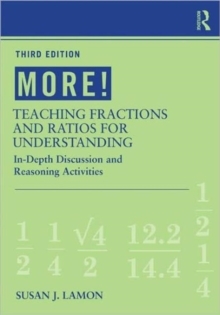 More is not an answer key but a resource that provides the scaffolding for the groundbreaking approach to fraction and ratio instruction presented in its companion text, Teaching Fractions and Ratios. Keeping the focus on the reasoning needed to properly understand and teach rational numbers, More shows teachers how to engage in powerful ways of thinking so that they can, in turn, enhance the mathematical education of their students. Like its companion text, More has been heavily expanded and reorganized, including even more student work, templates for key manipulatives, and an emphasis on applications to everyday life. Based on the content chapters in Teaching Fractions and Ratios, each chapter includes:In-depth Discussions of selected problems and their solutions. Supplementary Activities and a collection of challenging problems involving fractions. Praxis Preparation Questions geared to the content of each chapter.